Facebook has made several changes to its messaging system including both a filtering system and a paid service for contacting Facebook users outside of your friend network. The filtering system allows users to restrict messages in their inbox to be only from friends or “people they may know” (friends of friends). All other messages will go to the “other messages” inbox. The two options for filtering are “basic” and “strict”. 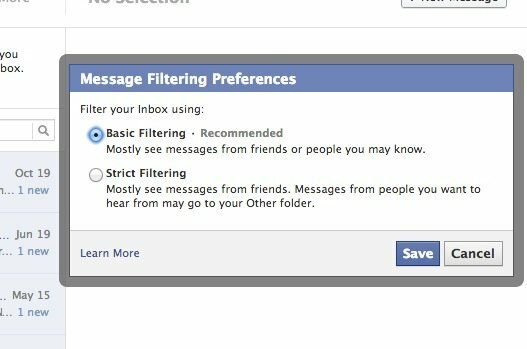 “Basic Filtering” is the default filter and permits only messages from friends or people you may know to go to your inbox. “Strict Filtering” allows only messaging from people with whom the user has a direct connection with. Additionally, Facebook has begun testing a program where users pay a small fee to have urgent messages delivered to someone with whom they are not connected. This is intended to cut down on unwanted messages. This pay-to-send service is only available for users, not brands. Messages can still be sent from users to non-friends without paying the $1 fee, but these messages will be delivered to the “other messages” folder. The message filtering is interesting because the defaults include “people you may know” – which are users that could have as few as ONE friend in common with a user and users who may not be friends but may both be members of the same Facebook group. Though Facebook has not indicated whether or not liking a page counts as a shared connection, the fact that defaults allow for messages from those other than just your direct friend connections opens the door for engagement with a user from someone who works on behalf of a brand, with some form of relevance and social context to the user. Think of it this way – If your brand has identified a group of users organically having conversations about your brand in a Facebook group, and a representative of the brand is a member of that group, you could conceivably message group leaders for potential influencer and ambassador programs. The paid service option could be leveraged by brands in a similar fashion. If a representative of a brand identifies an active user group on Facebook, the $1 fee for delivery of the message could be worth it in messaging the admin of the group and starting a conversation about ambassador activities and influencer programs. This communication would have to be user-to-user and would require someone working within the brand to make the connection to preserve transparency, rather than an agency or third party. The key things to watch here over the next several weeks as this is rolled out are whether or not Facebook allows common pages to be considered a shared connection between users (I can’t imagine they would as it would result in tons of spam) and whether or not this signifies the rise of Facebook groups in marketing campaigns.